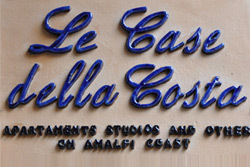 Centrally located, a short distance from the sea and the shopping area, Le Case della Costa is a complex which offers 6 gracious apartmentsset on the 4th floor of a modern palace served by an elevator. The apartments, which can accomodate from 2 to 7 people,have been recently renovated and take their names from the main touristic locations of the Amalfi coast. Each unit has a private terrace overlooking the bay of Maiori or the hisotric centre and is comfortably equipped with kitchenette, living room, private bathroom filled with famous Vietri majolica tiles, TV, phone, washing machine, heating, air conditioning, linen and iron.